Harvey,s Tiger Scramble Track was built and raced on in the mid fiftee's, by members of the Harvey Motorcycle Club and the Bunbury Motorcycle club. Harvey members prominent at the race meetings were Kevin Woolaman and Mr Miotti along with Bunbury members Taffy Thomas, Joe Tomerini and Gerald Fry. 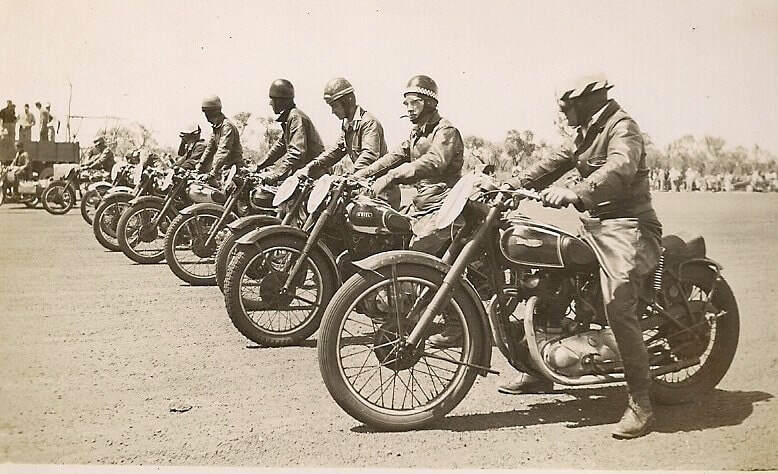 Menbers of the Harvey Motorcycle Club often attended competitions against the Collie and Bunbury clubs at there tracks as well as the Harley Scramble near the rope works at Buckland Hill in Mosman Park. The Royal blue jumpers emblem was a flying horse taken from the Turf cigarette packet. 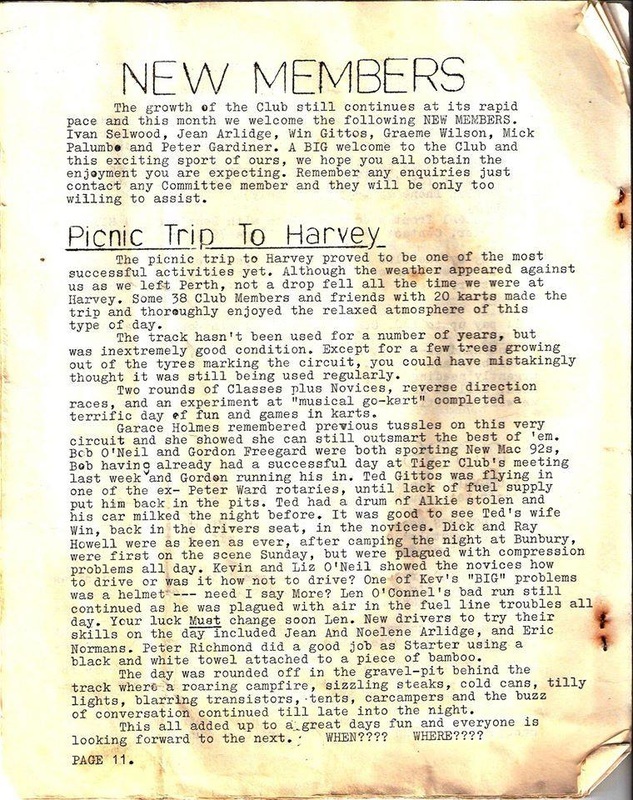 Other members of the Harvey club were, Bernie Sturmer, Otto and Charlie Gerschow, Loree Emberson, Muriel Johnson, Joyce Atthowe, Neil Bennett, Faye Norris, Graeme Coole and Syd Herring. By the mid to late sixtee's motorcycle racing had finished at the track and the site became the home to the Tigers Go Cart Track. 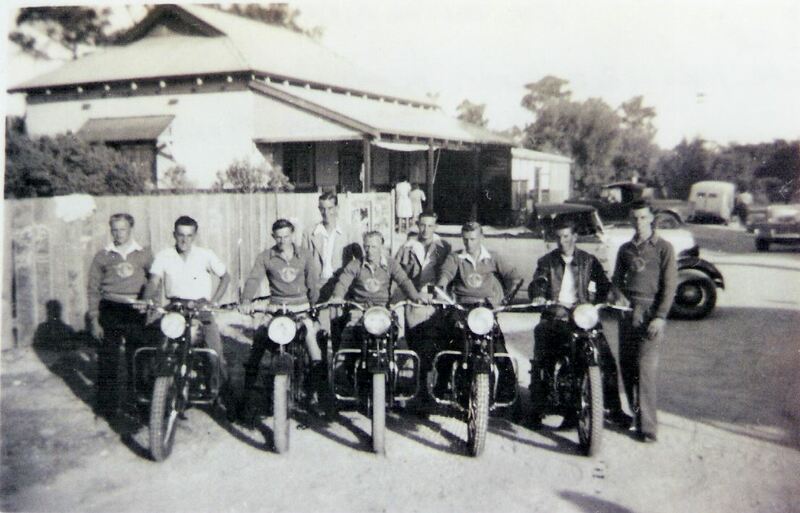 1950's - Cecil Hall - Bob Blake - Owen Garwood - Don Fielder - Tuppa Price - Alan Machete - Bob Hall - Malcolm Fielder and Nevile Clifton from the Harvey Motorcycle club pictured in Mandurah, At where the Atrium Resort is located today. Photo: Rob Halls collection. Memories of Harvey facebook photo feature. 1950's - Ross Payne leads the field away at a Motor Cycle TT event on the streets of Collie. Photo: Rob Halls collection. 1950's - Photo: Rob Halls collection. The Scramble and Go Cart track location is just a few k's North of Harvey on the South West Highway at the Honeymoon Road turnoff. In the late 1950's several club members turned the defunct motorcycle scramble track at ﻿Harvey into a Go Kart track. The Harvey Tiger Kart Club did hold some events over a two year period around the building at the Claremont Showground after the closure of the Harvey track. After the Claremont period the club moved its racing events to there newly built track in Cockburn, The club operated at this track through until the 1970's when it to closed an the Henderson circuit was built. I drove past the old Harvey Tiger Kart track on the way home from Bunbury, Its totally amazing, that after more than fifty years the track is mostly intact.